A few years ago the team was called to look for a missing male. The circumstances of the search led us to believe that he might be located close to the last known position (LKP) in a wooded area, so we sent about 20 members to search; I was one of them. On leaving the command vehicle to enter the area, the first thing I noticed is a clear and strong smell of rotten meat coming from the search area. It was a warm spring day, and the subject had been missing for more than one day. One of the things we are always prepared for is finding the subject deceased. The fact that we had been asked to look for this individual in an wooded area in the middle of an urban centre meant that he was not considered mobile or responsive, and that he was very possibly deceased. In fact, due to other clues in the case, the RCMP suspected he had been killed. In Ground Search and Rescue (GSAR) training we’re taught to consider all clues when looking for a lost person, including tracks, animal tracks, birds and smell — scavengers are often used to locate someone who is dead. Being able to smell something this early in the search led me to believe that the subject was dead, and not far from where we were. Several hours later we had found nothing. We had been walking through the bush in a maze of trails and trying to use our noses to find out where the smell was coming from. Of course the human nose is a pretty rough instrument, and a dog was not available until later in the day. We has resorted to doing several “closed grid” passes through the bush. This means lining up at about an arm length distance from each other and proceeding slowly forward — painstakingly slow and methodical. We found nothing but the usual garbage you find in an urban wooded area. There was quite a discussion among the 7 or 8 members of the team who were present about the smell and what could be the source. We figured it could be an animal. One member swore it was propane. It could also be drifting in from outside the area we had searched. In the middle of this discussion and while we were trying to figure out what to do next, Cam, a very experienced SAR member with more than a decade on the team, known for being quire taciturn, spoke up that the smell was coming from the mushrooms that were all around us on the forest floor. Some members had previously remarked on how ugly these particular fungi were, and now Cam picked one up and held it out to me as proof of his assertion that they smelled like rotting meat. Not really believing him, I leaned forward and took a sniff. Now this was not a small, tentative sniff which you might use if you knew something smelled disgusting, as this mushroom most definitely did. Not quite believing that we had wasted most of a day looking for a smell that was coming from a plant, I took a whiff like you might when trying to detect a faint smell among other, normal smelling things. Imagine leaning forward to take a deep smell of dog poo, and you might have a sense of the overwhelming sensation I experienced smelling this fungi. It felt like my mouth and face were filled with a vile, horrible substance. I very nearly lost my lunch and spent the next several minutes recovering from the experience. We abandoned the area and continued the search elsewhere. 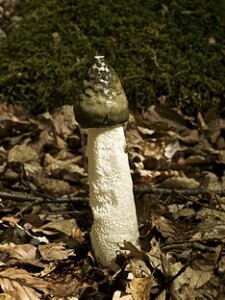 I believe the mushroom in question is known as the common stinkhorn, or Phallus impudicus. If you think the word “phallus” is familiar here, you’re right; they also look disgusting, like little penises sticking out of the dirt. The top of each fungus is covered with a slimy green cap, and is often covered by flies. What’s worse is the “egg” form of the fungus, which the phallus grows out of, looks just like testicles. A quick Google for images of this plant will show you many instances of this (may not be safe for work, or if you are easily disgusted). It turns out that they are well known for their smell, and can be quite a problem if they are growing near your house. The smell is used to attract insects to the slimy green area on the plant which contains the spores — the insects spread these. Apparently they can be eaten before they reach the “fruit” stage but I am not tempted. Later in the week we went back to the search area with a cadaver dog (trained to search for dead people). He didn’t pay any mind to the mushrooms, which led us to believe that although they fool people and flies into thinking they are rotting meat, to the dog they don’t smell like a dead person.